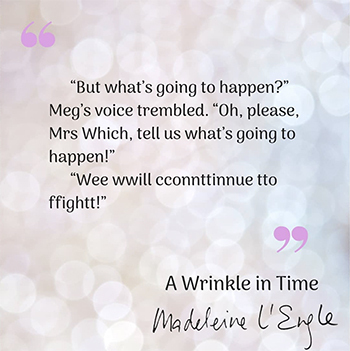 A Wrinkle in Time is a book written by a woman with a teenaged female protagonist and published on the cusp of the women’s movement – I just love that fact! Meg Murry was one of the very first strong young female protagonists, with some of the character’s details based on Madeleine L’Engle’s own struggles in her youth. A first for its time, Meg isn’t an idealized girl: she’s self-conscious, stubborn, quick to anger, and just different from everyone else. But it’s these so-called faults, as well as her love for her family, that helps her defeat evil when no one else, not her father or brother or friend, can. DCT’s Meg, played by Hannah Moore, is flanked by Mrs. Whatsit, played by Georgia Rose, and her father, played by Sam Hurley, as she contemplates the journey to save her brother, Charles Wallace, from IT. I love that DCT’s production is performed by a youth ensemble – the perfect age to be inspired by a character like Meg. If you want to experience a story about overcoming adversity, good triumphing over evil, and teens saving the day, then this show is for you! 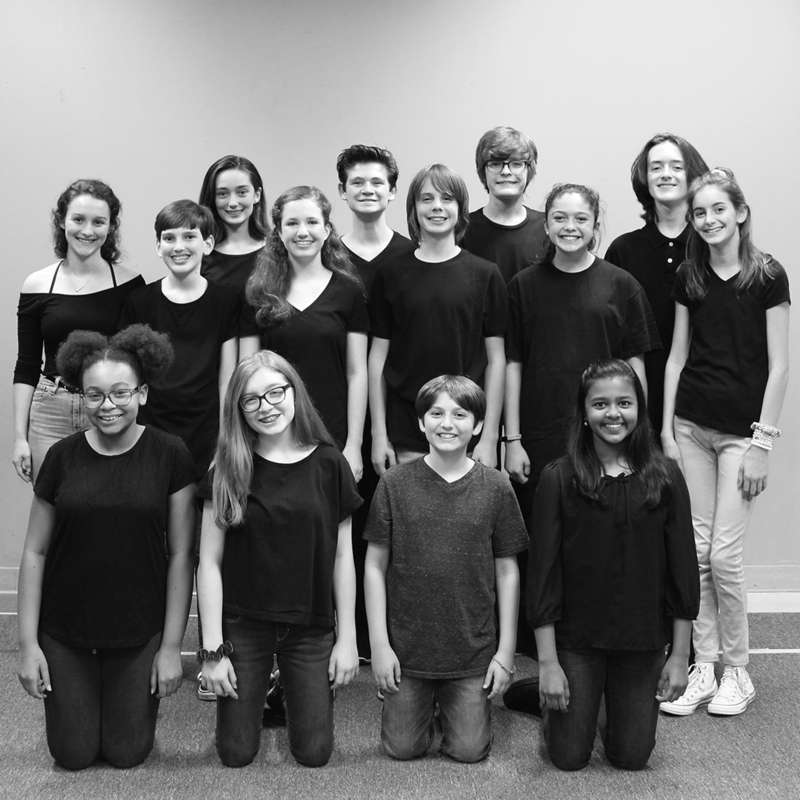 Check out Dallas Children’s Theater’s Teen Scene Players as they present A WRINKLE IN TIME. Only a few seats remain…Buy your tickets now! It was a dark and stormy night when Meg Murry’s journey began. Mrs. Whatsit, a mind-reading celestial being, arrives to tell Meg about the evil forces that are holding her missing father prisoner on another planet and the existence of a tesseract – a sort of wrinkle in space and time – that will help her save him. Mrs. Whatsit and two of her unconventional friends (Mrs. Who and Mrs. 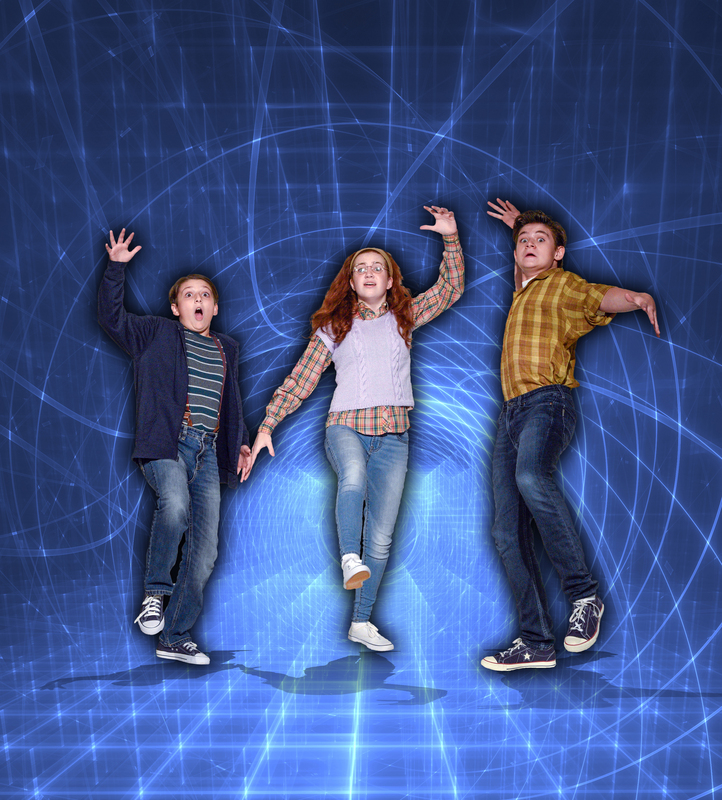 Which) transport Meg along with her super-genius younger brother Charles Wallace, and friend CalvinO’Keefe through the fifth dimension on a quest to rescue her father and free the universe. This groundbreaking sci-fi/fantasy tale captures the classic struggle between good and evil, the power of love, and the value of individuality. Teens can save the world! 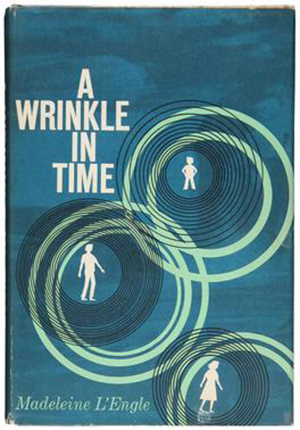 When I first read Madeleine L’Engle’s A Wrinkle in Time, I probably didn’t realize that it was a ground-breaking novel, I just knew that I really liked it. Now, as I think about A Wrinkle in Time, I’m amazed how much persistence and determination it took just to get this book in readers’ hands. L’Engle was spurned 26 (!) 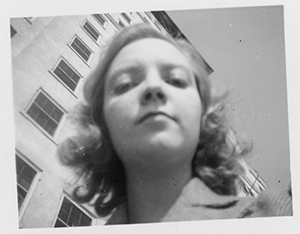 times before a publisher was interested in her book. Despite overwhelming rejection, the book was a hit with readers and hasn’t been out of print EVER (and still continues to be a required-reading pick for teachers all across the country). It earned the prestigious Newbery Medal (among other awards), but was also deemed controversial and banned (even listed by the American Library Association as one of the “100 most frequently challenged books” for decades). The book was considered a first of its kind for children (she was told that science fantasy wasn’t appropriate for her intended audience), and L’Engle had to fight for her story’s survival– and we are all so fortunate that, like the book’s heroine Meg, L’Engle was victorious! We invite you to come see for yourself why this story of good versus evil has withstood the test of time. 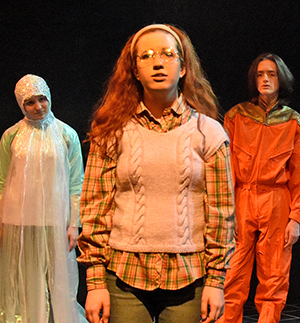 Dallas Children’s Theater’s Teen Scene Players present A WRINKLE IN TIME. Limited seating available. Get your tickets now! It’s true…teens can save the world. Previous DCT Roles: Peter and the Starcatcher (Smee). Favorite show and why: The Book of Mormon because I love the music and songs. Favorite thing about acting: The audience’s reactions. Previous DCT Roles: Peter and the Starcatcher (Betty Bumbrake), EAT (It’s Not About Food) (Cheerio Lady, Angry Teen), and The Ghosts of Sleepy Hollow (the woman in white). Favorite Show and Why: The Ghosts of Sleepy Hollow because it was my first real show and the character was so unique, and the cast bond was special. Favorite Thing About Acting: Making the audience feel something. Previous DCT Roles: EAT (It’s Not About Food) (Emily), Peter and the Starcatcher (Frenchie), and Next Stop Broadway (2017 and 2018). Favorite Show and Why: EAT (It’s Not About Food) because the show meant something; it was beyond entertainment. Favorite Thing About Acting: Being something different every time. You get to be out of yourself and leave the real world. Previous DCT Roles: Alice in Wonderland (Mad Hatter) and Next Stop Broadway (2018). Favorite Show and Why: Stranger Things because the mysticism and mystery of the show is very interesting and fun to watch. Favorite Thing About Acting: Being on stage and doing what I love. Previous DCT Roles: Alice in Wonderland (Caterpillar), Ghouls & Graveyards (The Boy/Herbert), and Peter and the Starcatcher (Prentis). Favorite Show and Why: Cabaret because the meaning of the story has really made an impact on me. Favorite Thing About Acting: Having fun, doing well, and acting – so pretty much everything. 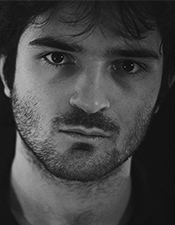 Previous DCT Roles: Ghouls & Graveyards (Ghoul 5, and Factory Worker) and Screen Play (Daniel). Favorite Show and Why: James and the Giant Peach because it’s really entertaining and creative. Favorite Thing About Acting: It’s always great to meet my castmates and get to perform in front of people. Favorite Show and Why: A Midsummer Night’s Dream because it was my first Shakespeare play and I loved the role of Hermia that I played. 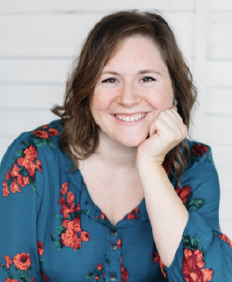 Favorite Thing About Acting: Being able to experience someone else’s feelings and the connection with the cast. Favorite Thing About Acting: Losing yourself for a few hours and pretending to be someone/something else. Favorite Show and Why: Les Misérables because I enjoy the music and action. Favorite Thing About Acting: Being someone else. Previous DCT Roles: Seussification of a Midsummer Night’s Dream (Puck), Alex in Wonderland (Alex), and Next Stop Broadway (2018). Favorite Show and Why: BFG (Big Friendly Giant) because I volunteered at the sensory-friendly show. Favorite Thing About Acting: Being so many different people and learning about life through theater. Previous DCT Roles: Ghouls & Graveyards (Morris), Screen Play (Jeffery), and Peter and the Starcatcher (Lord Aster). Favorite Show and Why: The Outsiders because I knew everybody in the cast since I was a young child. 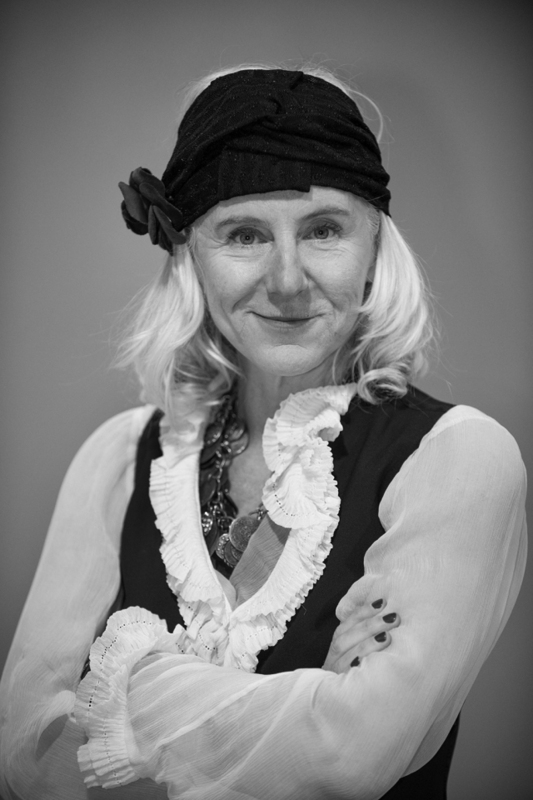 Favorite Thing About Acting: Playing a character. Previous DCT Roles: Miracle on 34th Street and Next Stop Broadway (2016, 2017, 2018). Favorite Show and Why: Heathers because the music is amazing. Favorite Thing About Acting: Really getting to know the character you play. Previous DCT Roles: EAT (It’s Not About Food) (Girl), Miracle on 34th Street (Elf), and Ghouls & Graveyards (Banshee). Favorite Show and Why: My favorite show I’ve been in is Anne of Green Gables when I played Anne Shirley. My favorite show I’ve seen is Hamilton in Chicago. Favorite Thing About Acting: Getting to tell a story and give the gift to the audience! Favorite Show and Why: I love Dear Evan Hansen as it is a powerful and emotional story. Favorite Thing About Acting: It lets me be anyone, even the complete opposite of myself. 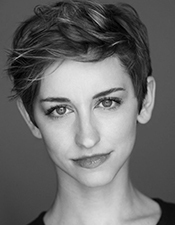 Fanny Kerwich brings the powerful side of the circus to the production of TREASURE ISLAND Reimagined! In real life, ships are made of wood. 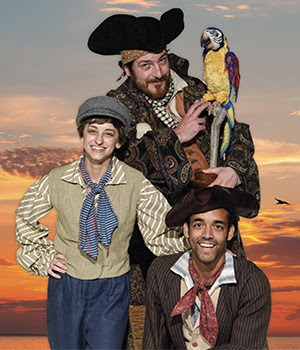 But in the world of Jim Hawkins, Ben Gunn, and Long John Silver, it takes a crew full of imaginative, expressive circus-trained performers to get things in tip top shape. 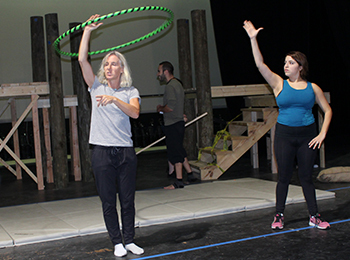 We wanted to learn more about the amazing circus feats seen in TREASURE ISLAND Reimagined!, so we sat down with Fanny Kerwich, Circus Director for the show, to learn more. How are circus techniques and acrobatics being used to tell this story? 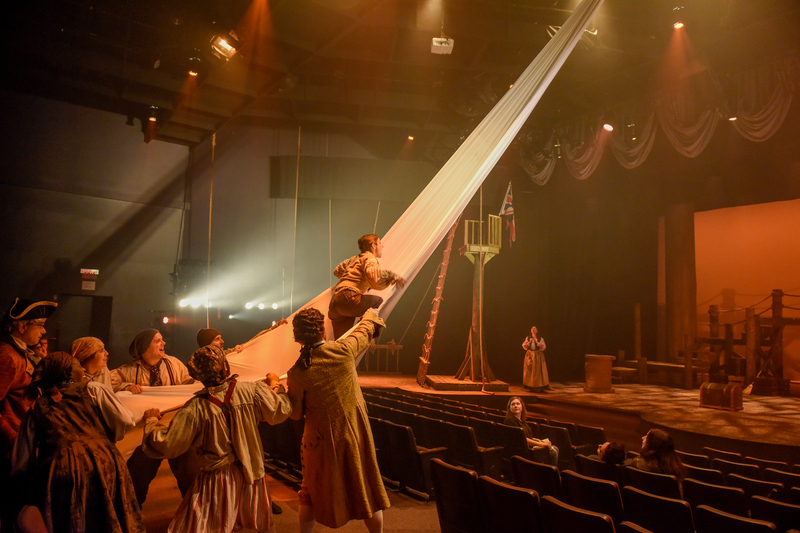 In this story, circus and acrobatics are being used to tell the story of Jim Hawkins’ first impression of being on the Hispaniola. In the story, the minute Jim walks onto the ship, he is struck with awe and wonder at the intricate inner workings of a sailing ship. We thought the best way to capture Jim’s childlike first impressions would be through the high flying wonder of circus rope tricks, juggling, and aerial acrobatics. As we developed the script, the circus techniques we used evolved with the needs of the script. While the idea to build the ship using circus skills was always a part of the plan, we also found the need to include other circus moments, like creating the illusion that Ben Gunn was climbing through the forest with the ropes or changing the use of hula hoops into rope swinging. Describe the training you gave the cast and what went into conquering the moves you taught them to use on stage? I focused on basic circus skills with the goal of accomplishing extraordinary things on stage. Of course, when I work with novices, I always need to scale down the intensity of the skills I am asking them to do. I believe that it is better for someone to do something they can do well, than it is for someone to do something badly that they haven’t yet mastered. I’m very impressed and proud of the work that this cast put into learning the circus skills necessary to pull this production off. In the short timespan that they’ve had, they’ve managed to learn a whole plethora of skills and have been absolute troopers about learning them. 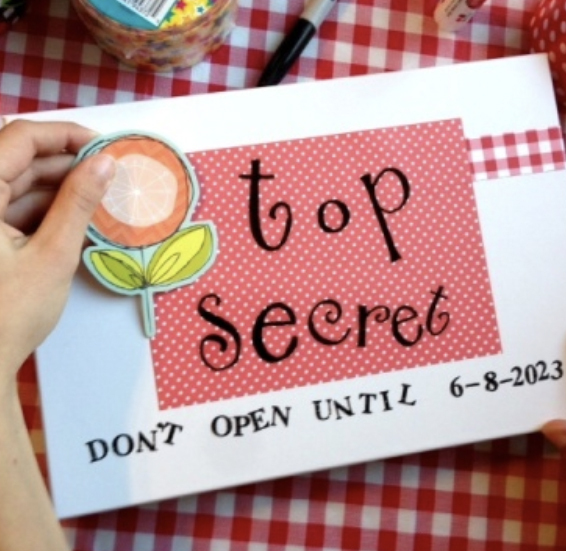 What is most exciting to you about this project, and why do you think families will enjoy this production? Historically, theater and circus used to be an art form that was one in the same, and anytime we can bring these two art forms together, I always believe it results in a beautiful production. The collaboration with puppetry, theater and circus – three different forms of expression combined together in an exciting mix; it really creates entertainment for all ages and tastes. I’m so glad that Robyn included circus in this production. Buy your tickets now before this ship sails! 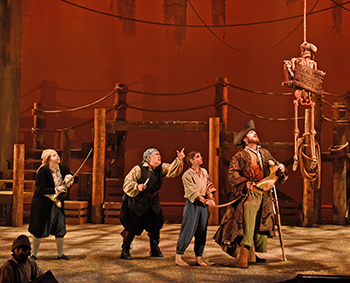 When the collaborating companies first started reimagining the classic tale of Treasure Island, each company presented many ideas about how their artistic discipline could best help in telling the most dramatic, compelling and entertaining story. 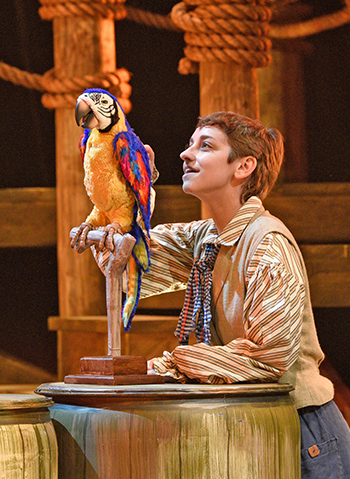 We sat down with Sally Fiorello, Master Puppeteer with Kathy Burks Theatre of Puppetry Arts and puppeteer and ensemble cast member of TREASURE ISLAND Reimagined!, to learn how puppetry helped shape this production. 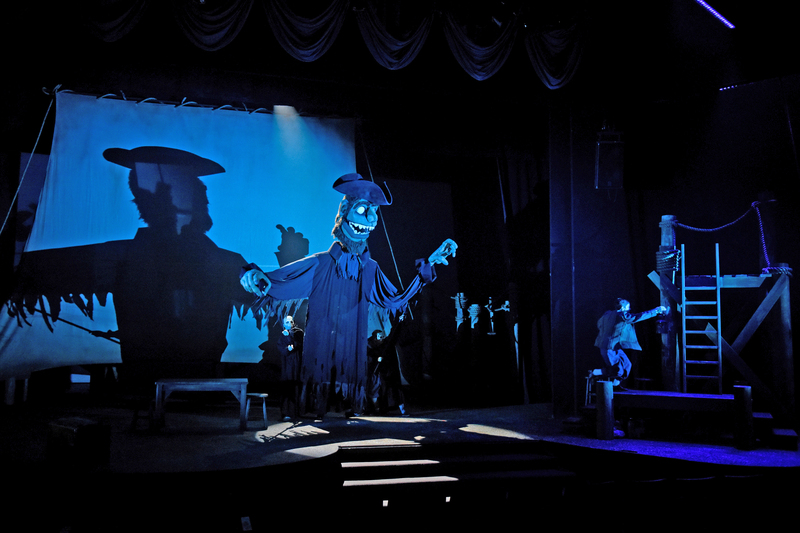 The giant Long John Silver puppet built by Fiorello and puppetry constructor Beck Schlabach enters Jim Hawkins’ dreams. How is puppetry being used to tell this story? After workshopping several ideas and multiple years of writing and rewriting the script, we decided that creating and utilizing nontraditional puppetry would be the perfect way to dramatize both nightmare and fantasy sequences that occur in the play. As a result, like the young character Jim Hawkins, audiences will be astounded and shaken by the unexpected, larger-than-life nightmare of the one-legged pirate named Long John Silver. They will experience the magic and beauty of a night sky full of constellations that come to life in a way never before seen on stage. And finally, through the use of animatronics, they will enjoy the antics of Long John’s iconic parrot. Please describe the puppet in these pictures and what went into making it. 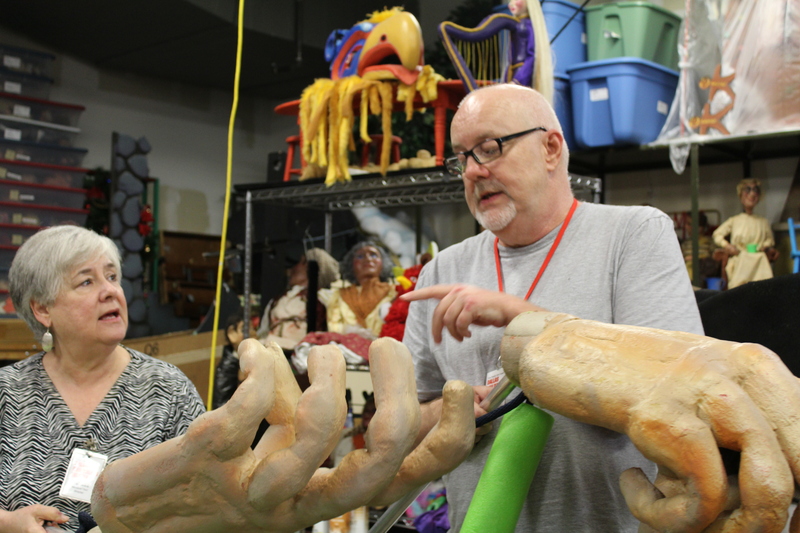 The head that you see in the picture, along with its hands that Doug and I are holding, are actually the beginning stages of the giant Long John Silver puppet that comes to life in Jim Hawkins’ nightmare and serves as a foreboding of the infamous pirate’s true character. As with all creations for the stage and screen, puppets are first designed on paper or a computer. 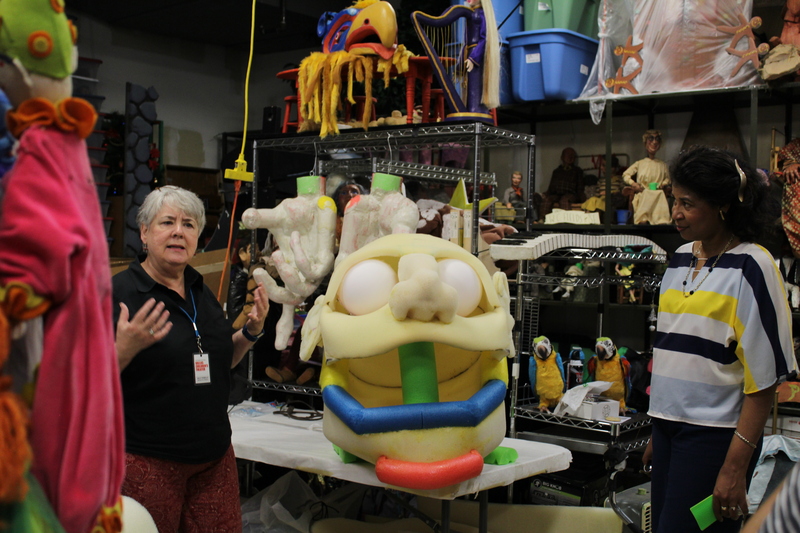 Since this puppet is more than twice the size of a normal human and the head is made out of reticulated foam (outdoor upholstery foam), a small model had to be made in order to devise a pattern for creating the proper shape. It’s always better to create something in miniature at first so that you don’t waste time and expensive materials trying to figure things out in full size. Also, you might find that you want to make some changes to the final design before it’s too late. Once the smaller pattern shapes are made, they are then enlarged and laid on the foam for cutting. The cut pieces of foam are then glued together with contact cement creating the basic shape you see here. The eyes are fashioned from hollow plastic balls. Other structures are created using pool noodles, which are a great product to work with and very light weight. Weight is extremely important when you’re building a 15-foot-tall puppet that has to be puppeteered easily about the stage on long poles. With the addition of more sculpted facial features and paint, the puppet begins to come to life. Once the hair, beard, gnarly teeth and ghostly body are added, this Long John really takes on the scary visage we aimed to create for Jim’s nightmare. We certainly hope the audience thinks so as well and enjoys him as much as we do. 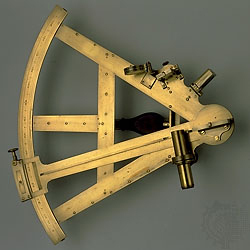 What is most exciting to you about this project? The most exciting part of this project was working together with other artists of different disciplines to create something special and unique, something that no one had ever seen before. From the beginning, there were no bad ideas. We were only limited by the boundaries of our own imaginations. We had time to explore different ideas and concepts, to figure out how we could best come together and make the most dramatic contribution to the telling of the story. 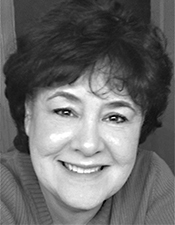 It is not often that theatrical artists have this opportunity in the creation process. The ongoing discussions and workshops truly gave us time and inspiration to think outside of the box and create some magical theater! Why do you think families will enjoy this production? I know audiences will enjoy this production because it has everything in it that one could want from their entertainment. 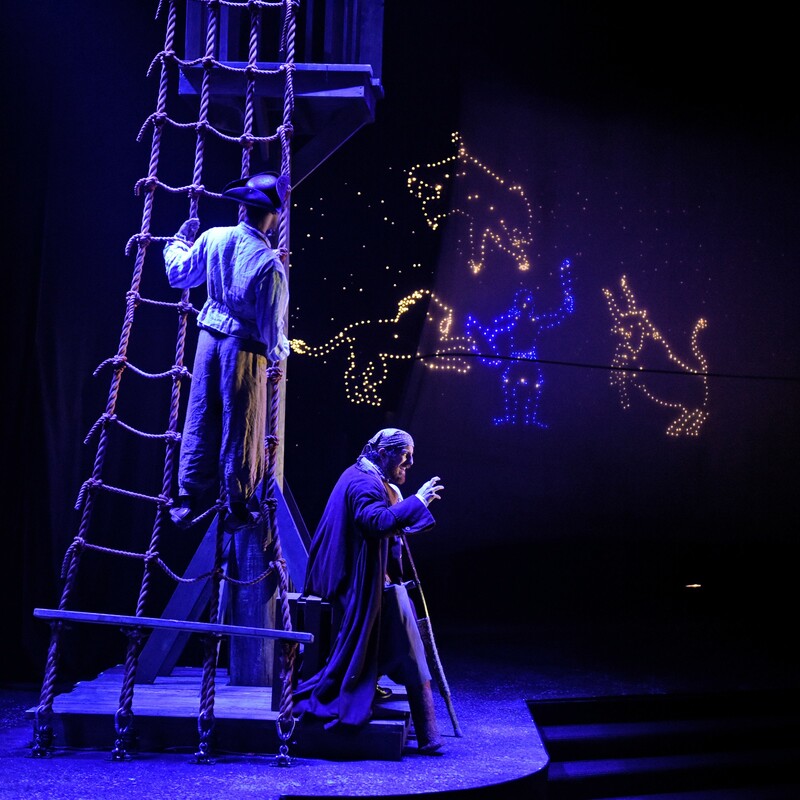 It has heroes and villains; pirates, swordplay and treasure; comedy, drama and adventure on the high seas – all of the things that make for a great theater experience. But even greater, this production has been completely reimagined to tell the story from more than one character’s perspective. We all find out things we never knew about these iconic figures. The story unfolds on a beautiful set and throughout the theater. 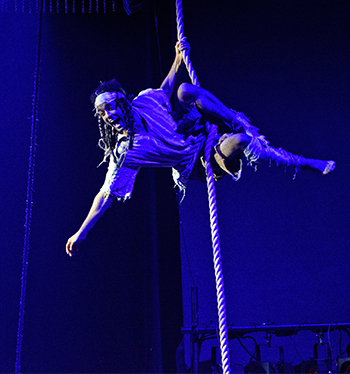 The audience is often right in the middle of the action with shipboard acrobatics taking everyone’s breath away and unexpected puppetry bringing magical and unforgettable images to life. 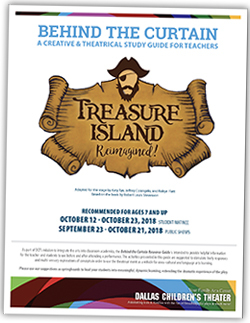 I know that one could say I’m biased, but I believe that TREASURE ISLAND REIMAGINED is a fantastic show for everyone! 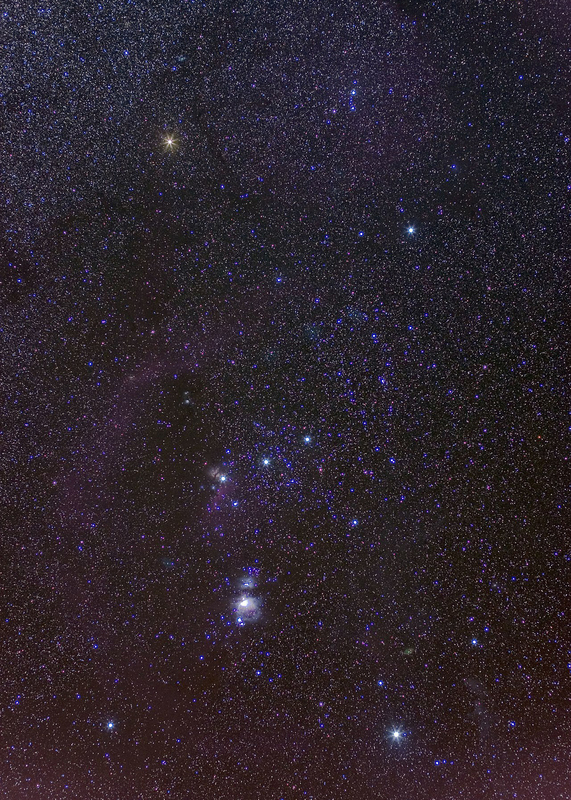 Can you guess the names of all of the constellations in this photo? If not, you should come see the show! 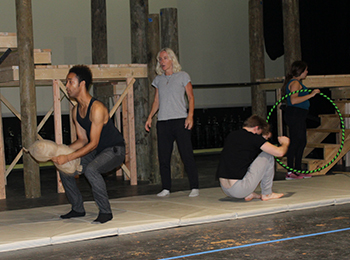 Movement is being used in a variety of ways to help tell the story of Treasure Island in this reimagined production, so we sat down with Katy Tye (KT) and Jeff Colangelo (JC), founders of Prism Movement Theatre, to understand how physical theater was incorporated into the presentation. How are movement and combat techniques being used to tell this story? KT: All acting is movement in my opinion, or should be. However, Treasure Island is a special case because it is a nonstop adventure involving pirates at sea. 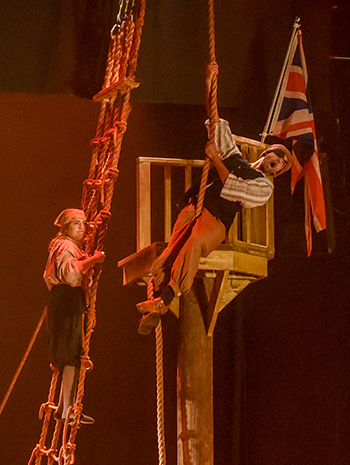 The pirates in this production all learned or provided different skills to truly embody the work of sailors — like climbing ropes — which adds to the characters and the environment of the piece. On top of the sailing skills, our pirates had to fight, cause… they’re pirates! Jeff choreographed some great fights. Sword fighting, circus work, puppetry all coming together to tell a beautiful story. JC: Almost every 10 minutes, there’s a new fight scene or circus section or rope climbing or puppets being used to tell this amazing story. And the best part is that almost ALL of it is in the book, [and now it’s] brought to life onstage. If you really want to see a Treasure Island that captures the heart of the book and the true harrowing adventure that Jim goes on, this is the show for you. 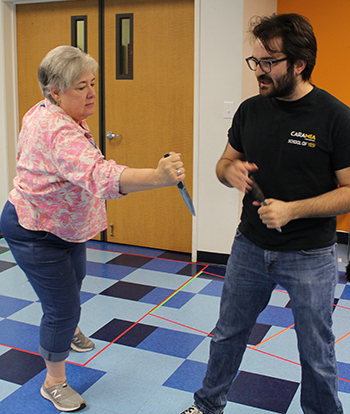 Jeff Colangelo, right, teaches sword fighting techniques to Sally Fiorello at a TREASURE ISLAND Reimagined! rehearsal. Jeff Colangelo, left, and Katy Tye, right, who plays Jim Hawkins, during a fight scene. Describe your favorite scene involving either movement or combat, and what went into making it. KT: My favorite scene involving combat is my fight between Israel and Jim. Jeff choreographed it almost exactly as Robert Lewis Stevenson described it, and it is intense. A pirate is about to stab a boy to death until the boat throws them off balance, and the kid is able to climb up a rope. Once there, Israel throws a knife into Jim’s shoulder climbing up to kill him, and then Jim shoots and kills him. It’s one of the most intense fights I’ve done, and it’s while playing a 10-year-old boy in a kid’s show! Jeff and I are huge fans of magic thanks to our friend and collaborator Trigg Watson, and in our fight, we get to do a little magic together which is so fun! 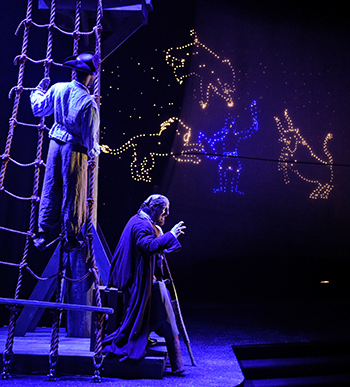 Aaron Jay Green, left, who plays Ben Gunn, hears the tale of Orion from Marcus Stimac, right, who plays Long John Silver. 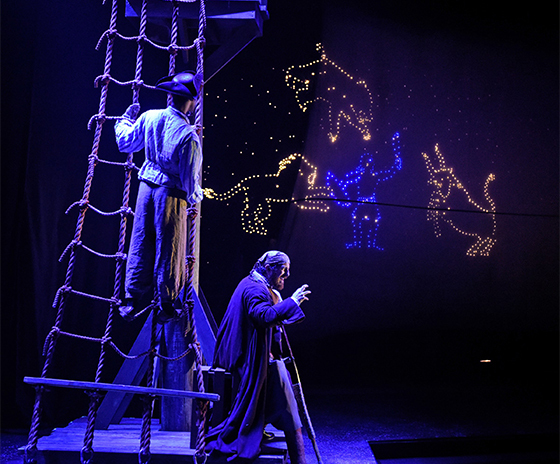 JC: My favorite scene is actually the constellations scene, where Long John tells a young Ben Gunn the story of Orion and the scorpion and those constellations come to life through handmade puppets. There’s just so many beautiful things going on in that scene, from Sally’s puppetry to the construction of the constellation puppets to the acting. Even the lighting and music make that moment so beautiful and impactful for me. The scene itself is so wonderfully multilayered with Long John, a famous, almost mythical pirate of legend, telling a story about a mythical figure that inspired him as a boy. And while [the audience is] being told this beautiful story, Long John is actually using this tale to manipulate those around him to get what he wants. It’s truly an effective and awe-inspiring piece of storytelling from the whole team. 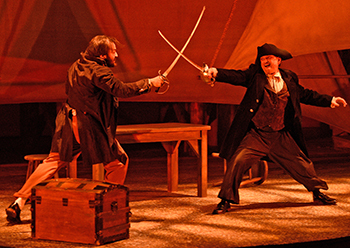 Jeff Colangelo, left, sword fights with Karl Schaeffer during a performance. What is most exciting to you about this project? Why do you think families will enjoy this production? KT: The most exciting thing about this project to me is how much interdisciplinary work there is in the piece and yet none of them distract from each other. The script compliments the movement, which compliments the puppetry, etc. Families will enjoy it no matter what; there is truly never a dull moment. JC: I think this project is so exciting because it offers a take on the Treasure Island story that doesn’t shy away from the danger that these pirates brought with them on their adventures. At every moment, these people are trying to outwit each other and betray each other to get rich quick, and I think it’s important that this production doesn’t pull any punches in telling that story. 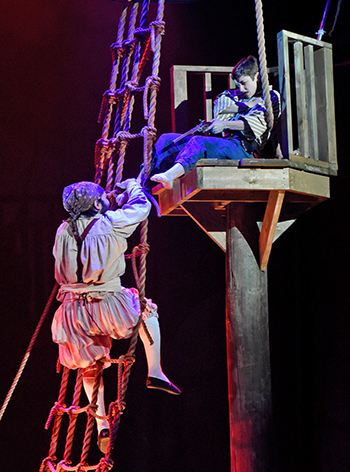 By presenting an adventure with truly harrowing danger, it makes the entire adventure of Treasure Island all the more exciting to watch, and it makes adults and kids alike appreciate the happy and beautiful moments of the play even more. In the end, how can you truly appreciate the good things life has to bring if you’re never presented with some of the scary stuff as well? JC: I think families will absolutely LOVE this production. It brings to life the story of a classic kid’s book in a way that is fun, engaging and extremely exciting. There’s absolutely nothing to be bored by during this play, if the actors aren’t fighting, five minutes later they’ll be doing puppetry; if they aren’t doing puppetry, they’ll be doing circus tricks and so on. This is definitely an exciting adventure that young and old pirates at heart will have a great time at.